St James church is built of Indiana limestone in the Gothic style of the 11th and 12th centuries. It’s building was begun in February, 1928. It was dedicated on August 10, 1930. The upstairs church contains many artistic touches including stations of the cross made with very detailed mosaics and many decorative wooden objects such as St. Luke’s symbol on the pulpit. One of the outstanding features of the edifice is the Italian mosaic altar picture, set in a 35 foot high hand carved oak frame of Gothic grace and beauty. It was carved by the Sportelli family in Patterson, New Jersey. The arched mosaic panel of the altar, constructed in Venice, depicts the darkening of the heavens and the eclipse of the sun during the Crucifixion. The arched columns of the altar are green Italian marble quarried in Genoa. It is set in a hand-carved Gothic oak frame, featuring numerous carvings of apostles and saints. 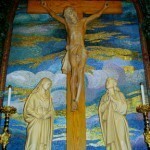 Beneath the large wooden cross are hand-carved oak statues of Mary, Jesus’ mother, and the Apostle John. The new organ was installed in 1963, replacing a very small organ mounted in the choir loft. It originally was placed behind Mary’s altar on the left. In 1981, it was moved to its current location in front of Mary’s altar on the left. This move cost $25,000 and entailed an extension of the thousands of wires used to control each note. The collection of wooden and metal pipes are located along the walls on each side of the church, just in front of St. Joseph and St. Mary altars.